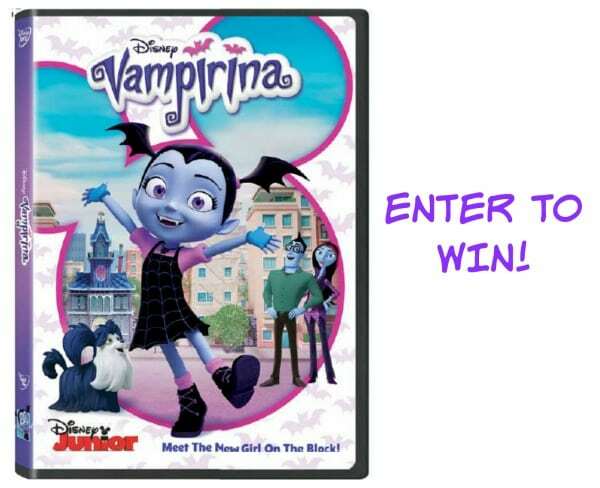 NEW to Disney DVD: Fang-tastic Fun with Vampirina + Reader Giveaway! Reader Giveaway: Two lucky Jinxy Kids readers will get a copy of Vampirina: Volume 1 on DVD. To enter, just complete the entry form below by 11:59 pm on 10/30/17. Good luck! “Who in your family is most excited to see Vampirina? Or if you’ve already seen some episodes of this NEW show, what have you liked about it?” No one here know anything, and we all want to learn more! My niece would be most excited to win Vamparina. Thanks for the giveaway. I hope that I win. I think my niece would enjoy this….but I’d also like to see it. My son and daughters would love this. It sounds like a fun new show for the kids. Our girls would like Vamparina, they really like her looks. My niece would be excited. I have only seen minutes of this here and there but I think she is an absolutely adorable character. My kids are 15 years apart so while I still have a 12 year old at home, I also have a 4 year old granddaughter here several mornings a week and this in one show that even at the different ages, they both like to watch. My 7 year old daughter and my granddaughter. My daughter has been watching this show recently. It hasn’t replaced My Little Pony and PAW Patrol, LOL, but it’s definitely in the rotation! My niece is the most excited to see this show. I think my niece would love Vampirina. My grandchildren are most excited to see this! My daughter has seen the first episode and she absolutely loves it. My 7 year old is going to love this! My 3 year old is obsessed with this show! She loves the music and funny characters. We haven’t seen the show yet but I think my granddaughter would be really excited to see it. This looks adorable. My daughter is going to love it. Wow we have not heard of vampirina until now it looks super adorable my girls would all love to watch . My daughter loves Vampirina. It’s her new favorite show! My granddaughter loves this show. It looks like something my kids would like. My 3 year old daughter, Shelby, is most excited to see this! She loves Halloween! My granddaughter Gwen would love to see this! I’d like to have this DVD for our family to enjoy. It looks like a cute series. My little cousin would love this. He loves the show. Thanks! My cousin! She loves this show!! My niece is very excited to watch Vampirina. Thank you. my daughter would love this. she is a big fan. My granddaughter would be excited to see it. We haven’t seen this yet, but it looks like a show my youngest would love! my daughter Brieah would love this show! My 2 daughters are very excited to see this show on DVD. We already watch it on Disney Jr and they are big fans of the show! My niece will love it! My son would love to see this!! He loves everything having to do with monsters and halloween!! My little cousin is excited to see this. I think that my nephews would get a kick out of this! I would say my nephews. My grandson is excited to see this show! I would love to watch this with my granddaughter, Riley. We are going t be stuck indoors once winter hits so we might as well have fun! Thanks!